I decided to make our Christmas cards this year. -One, because I knew I wasn't going to get around to taking holiday pictures with Jordan. -Two, because I was feeling too lazy to design a card and order it online. Too much stress! But the real reason is that ever since I finished my wedding scrapbook, I've been feeling crafty. So I grabbed my canvas bags (because plastic bags are taking over my already tiny pantry/hot water heater closet) and went where else? Hobby Lobby. Hobby Lobby is like the Twilight Zone. I go in, and 2 minutes later it's dark outside and I am $50 poorer. But I always find something awesome, so it's okay. While browsing the aisles this time, I found something very exciting. If you like to do scrapbook stuff, you will be excited about this too. A month or so ago I went to a Stampin' Up party. I'd never heard of it before, but I immediately fell in love. (This is not an advertisement for Stampin' Up. I just love everything in their catalog.) Something I saw at the show blew my mind (note: not literally). 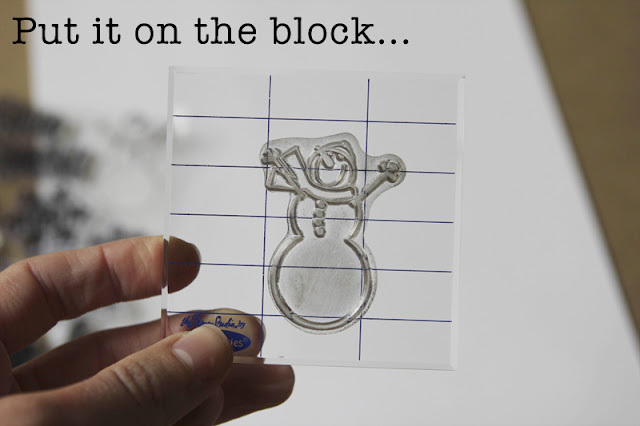 Check this out: a clear, acrylic stamp block. I didn't buy one from the party, and I was really sad. I felt like I'd missed out on a genius idea. So you can imagine my surprise and extreme excitement when I found one at Hobby Lobby! I should have known. Hobby Lobby has everything. If you have no idea why this block is awesome, just wait. 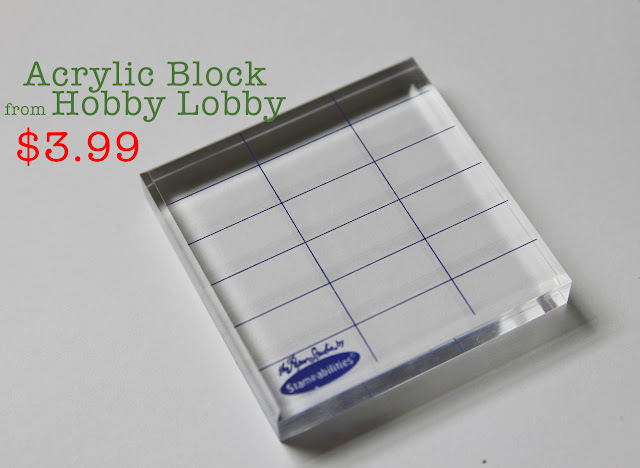 After you acquire the aforementioned block, it shouldn't be hard to find a sheet of clear stamps. 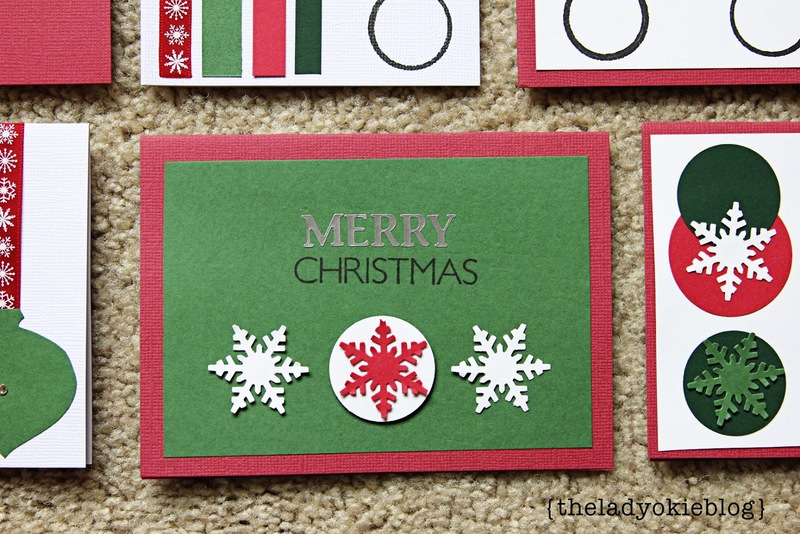 I got Christmas ones, but you can find stamps for whatever holiday/event you want! Then, just peel the stamp off, rinse, and stick it back on the sheet with the rest of the stickers. No more buying stamps that are $6 each or more. 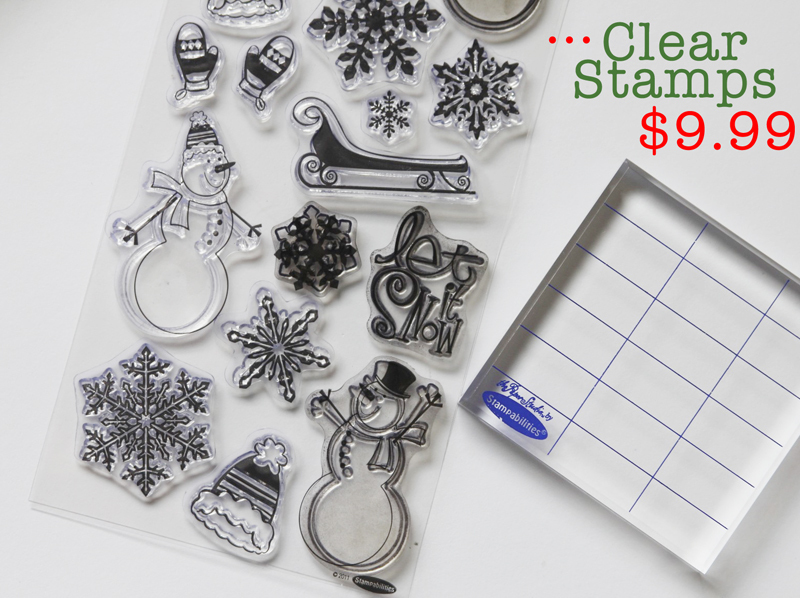 Now you can get an entire sheet of stamps for the price of one! I love genius ideas like this. At Hob Lob (that's what I call it now) I also picked up some Christmas ribbon and a set of blank cards and envelopes. I figure, at this point, people don't need a cute picture of us. 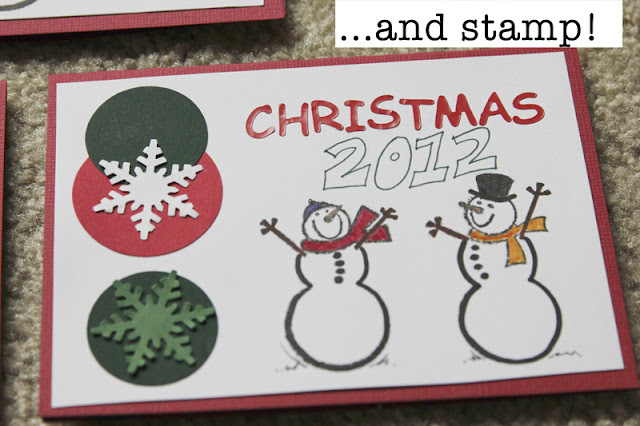 What they want is a cute snowman stamp and Christmas stickers. Am I right or am I right? Here are just a few of the cards I made using my awesome new acrylic block and clear stamps. No two are exactly alike, so everyone will get a unique card made just for them! 1. I no longer need to try to persuade Jordan to take Christmas pictures, meaning more leverage for me for the next time I want him to do something for me. 2. I scratched the scrapbooking itch. That sounds weirder than I meant it, but you crafters out there should know what I'm talking about. I'll be sending out my cards soon! Can't wait for everyone to get them! 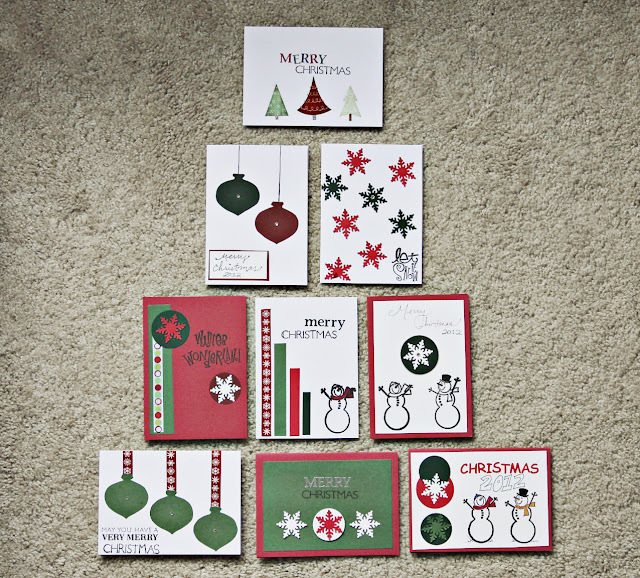 On that note, how soon is too soon to send out Christmas cards? When are you mailing yours? love the cards! so creative. I always get excited when I receive handmade cards in the mail! I sent mine out last weekend!! These are really, really cute. I love it. Do you take orders? If I ever get a hankering to send Christmas cards, I may commission you to make mine. Also, I support the non-picture idea, if only because it makes me feel far less guilty when I recycle the card after looking at it and letting it sit on my coffee table for a few weeks. I might still recycle pictures (shh, don't tell), but I always feel WAY more guilty about it. PS I'm just kidding. I don't think I've ever recycled a picture in my life. Those puppies go straight to the trash. PPS Okay but seriously. I am kidding. If people send me pics, they go on the fridge until I can't justify having a picture of said person/family on the fridge anymore (that being, if I don't actually know the people, if I don't have their number in my phone, or if the picture is so old they don't look like that anymore). those cards are so cute!! I hope I'm getting a card this year, but I peeked anyway. 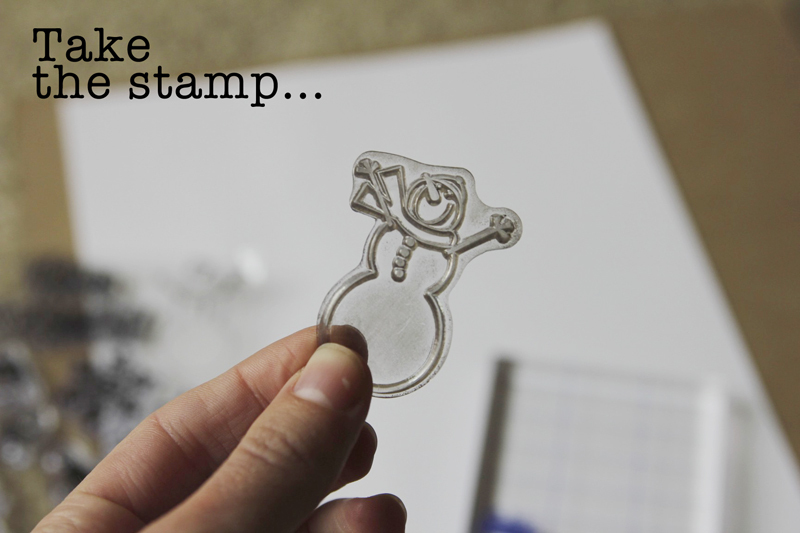 I also love Stampin Up and have recently been introduced to the acrylic stamp genius. Turns out my mom has tons of Stampin Up stamps and ink pads, and happened to have one that perfectly goes with our wedding stationary. 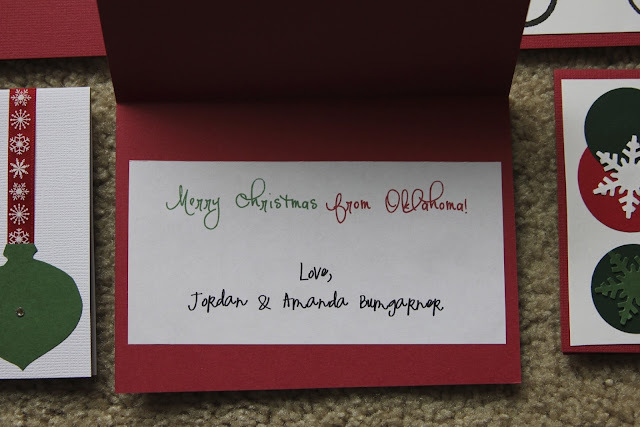 Thus, I will spend my Christmas break stamping thank you cards for our wedding! I LOVE that you made your cards! They are darling. Homemade cards are so much better! Giveaway: Custom Earrings from Petunkalunka!